All-Craft uses creative designs to turn your yard into an outdoor living environment that everyone will enjoy. Now that outdoor living spaces have become more common, your yard can be more than just a concrete slab or a rectangular deck. The goal with a custom backyard renovation is to integrate features that enhance the outdoor living experience, while at the same time, create a defined space for those features. 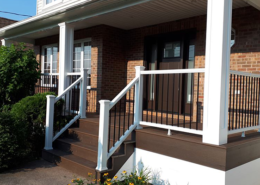 Similar to building a custom deck, you will need to establish a budget, determine if there are zoning restrictions, and check with your local Canadian Home Builders Association. Next, it’s time to consider how to design your custom outdoor living space. What are your unique tastes, how will you use the outdoor space, and what accessories are you interested in? 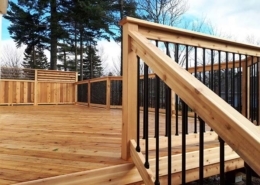 Accessories may include hot tubs, fire pits, built-in BBQ grills, built-in tables, deck and patio covers, pergolas, drainage systems, trellis, hardscapes, water features, heaters, walls, storage, lighting, and more. These features will play a large role in determining the size and layout of each individual’s outdoor living area. Outdoor living environments comprised of various components are complex projects that require the experience of a professional design and build company. At All-Craft, we have the knowledge and trade relations that include landscape designers, engineers, electricians, plumbers, gas fitters, truss builders, stone installers, landscapers, roofers, gutter installers, masons, painters, stucco, and wrought iron fabricators. These projects also require experienced field staff, such as foremen, to successfully manage these projects and keep them on schedule. Deck and patio covers provide shade from sunlight during the hot summer months, and they create a dry space to enjoy the outdoors during a wet day. Another great benefit of a cover is protection from inclement weather all year round. This is invaluable to those of us who enjoy outdoor hobbies like grilling, even in the winter! 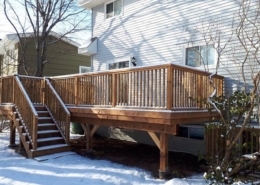 When designing a deck or patio cover, the primary objective is to create one that looks like it was built with your home. This is why custom-built covers are more desirable and aesthetically pleasing. 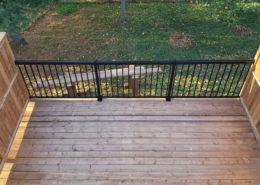 Unlike decks and pergolas, covers are rather simplistic in design and construction, resulting in simpler options. Choices include size, what type of roof design (gable, shed, or hip and ridge), how will the underside of the patio cover be finished (open, siding, or tongue and groove), do you want skylights, and do you want any electrical work done (lights, ceiling fans, or outlets). Smaller details such as posts, fascia, soffits, shingles, and gutters are typically built to match those features on your home. On rare occasions, existing conditions could make patio covers challenging to design and install; thus, the cost is subject to conditional changes. If your home has the potential for a cover, it’s a cost-effective option that will increase the amount of time you can spend outdoors – making it a worthwhile consideration. As the term implies, a built-in grill basically means “non-moveable”. The structure is permanent, although the grills can be removed if they need to be serviced. Built-in grills not only offer enhanced cooking features and quality, but they also make the grill a focal point of your outdoor living space. There are five basic components to a built-in grilling station; a propane or natural gas connection, the brand and size of the grill, the structure (custom or prefabricated), the visible face of the structure (stone, stucco, brick, or siding), and the countertop (usually granite). Most manufacturers also offer an array of features, not only for the grill, but accessories that accompany the grill. Built-in grilling stations can be quite large, as most include ample countertop space for seating. If the grilling station will be built on top of a deck, the weight needs to be accounted for when designing and building the structure.